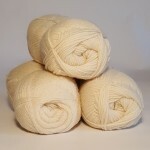 50g balls of lovely soft pure lambswool in both 2ply and 4ply weights. Lambswool is a gorgeous, soft pure wool yarn with a generous meterage and light handle. 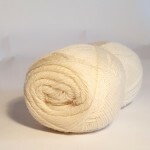 Available in two classic plys for delicate, lightweight projects across a wide range of crafts. Lambswool in these fine weights is ideal for delicate crochet projects or knitting by hand or machine (rewind onto a cone or flat ball first) on a standard gauge machine. 2ply is also known as “laceweight” which, as the name would suggest, is great for very intricate, lacy pieces. It has a good strength and natural elasticity, and should weave perfectly well with the 4ply being suitable for the warp as well as the weft, though the 2ply being perhaps more suited to just the weft. 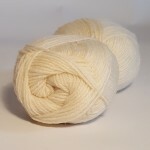 Pure wools such as this undyed, neutral coloured lambswool will dye easily with hot water, acid and natural dyes, though take care not to agitate it too much as it will felt. Perfect if you want soft, squishy felt, but be careful if you don’t! Knit, crochet or weave the yarn then agitate by hand or throw in the washing machine and it will shrink, consolidate and transform into really lovely felt. A great price for such a luxurious, versatile product.